Save $5 on Disney's puppy-RUFFic sequel available on Blu-ray this week! Disney has released another coupon offer, this time to save $5 on 'Treasure Buddies' Blu-ray available on January 31. 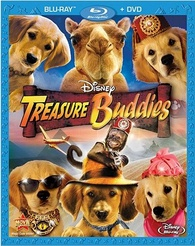 The Buddies are off on an all new adventure, and this time their journey takes them all the way to the ruins of ancient Egypt where, with the help of some new friends, including Digger the Archeologist dog, Cammy, a baby camel, and a mischievous monkey named Babi, they'll explore mysterious tombs, dodge treacherous booby traps, and race against a devious cat in search of the greatest treasure known to animalkind, the lost collar of Cleocatra..
Plus get 50 Disney Movie Rewards bonus points when you also enter the code for 'Snow Buddies' available on the same date! This coupon is valid in the United States and Canada only and the offer expires February 5.